10% Student Discount at RY - Recreate Yourself Calling all students! Save an incredible 10% on your orders with RY - Recreate Yourself. Sometimes shopping for beauty products can be a bit daunting. It can feel like there’s a million and one different things to get, from lipstick to conditioner, but luckily with RY you’ll find everything you need in one place, all at value that means you won’t be breaking the bank. There’s a truly astonishing range of skincare and haircare products on offer at RY, all at prices that you’re guaranteed to love. Beauty may only be skin deep, but with RY you’ll feel just as beautiful on the inside knowing how much you’ve saved on the outside. From hot rollers to lip primers and from shampoo to sunscreen, RY has everything you need to stay at the top of your game when it comes to your appearance. What’s more, with time-honoured brands like Babyliss, GHD, Wahl, Wella and many more, you’re shopping the best of the best when you shop with RY. How do I use my RY discount code? Sign up to RY’s newsletter and be the first to hear about sales, deals and discounts. Can I use Afterpay with RY? If you’re looking to spread out the cost of your purchase from RY, you can use Afterpay with absolutely no interest and absolutely no minimum spend. Does RY offer free delivery? RY offers free delivery on all orders with a value of $99 or more. Where are RY’s physical stores? RY has 2 stores, both in Queensland. There’s one in Brickworks and one in Burleigh. Standard Delivery: $6.95, free for orders of $99 or more. Tracked Delivery: $8.50, $3.50 for orders of $99 or more. Express Delivery: $12.95, $9.95 for orders of $99 or more. RY accepts returns on all items returned in their original condition within 30 days of delivery. If you’re looking for hair and beauty products, the search ends with RY, Australia’s largest haircare and skincare retailer. From waxing cuts to curling irons and from bronzers and blushers to scrubs and shampoos, shop with a RY discount code and get your hands on a sensational range of products without breaking the bank. A truly tremendous stockist, RY has everything you need to get yourself looking and feeling fully fabulous. 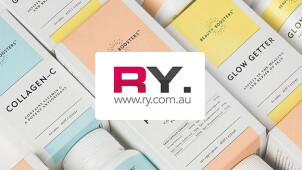 If you want to try out all the latest new beauty products from RY without committing to buy, you can use RY’s fantastic sampling scheme to test out new products and brands. With two free samples packed into every order, you’ll be able to discover a whole bunch of fantastic treats without the hefty price tag that might go with them. Try it out today and find your new favourite beauty product.